I was nosing around the Internet several weeks ago and came across these black and white brogues. I have such a weakness for assertive shoes (which my mother would call “ugly shoes”). Kate Spade Poppin Oxford: no longer available! Unfortunately, they were no longer available, but the desire had taken root. I felt compelled to search for the next best thing and found these. The Dainty Sianos, too, were no longer available through the Doc Martens website, but on the off-chance that Doc Martens retail and website inventories were not integrated, I called the Doc Martens store in Georgetown. Bingo! They had the shoes and so I paid for them by phone and told the clerk I’d come in within a day or two to pick them up. When I got off the phone, I looked at my calendar (crowded) and the forecast (rain) and realized it would be more efficient and far easier to send a courier to pick the shoes up for me. Another rush delivery from Doc Martens to Dunning Sponget & Leach? Never! Doc Martens are for everyone. I’ll wear them when I’m 65 and they’ll act as ankle weights and help me maintain bone density. But I did decide to fetch them myself, so I packed up a file of things to read, took a taxi to Bistro Francais, had lunch and picked up my shoes. The Directrice . . . keeping it real. For those of you seeking a pair of assertive shoes, these were the other contenders. And for those of you wondering how these shoes fit into a work wardrobe: They don’t. These are for the weekend, with jeans. Maybe casual Friday. Hi I’m Eleanor’s aunty, so glad she put me in touch. 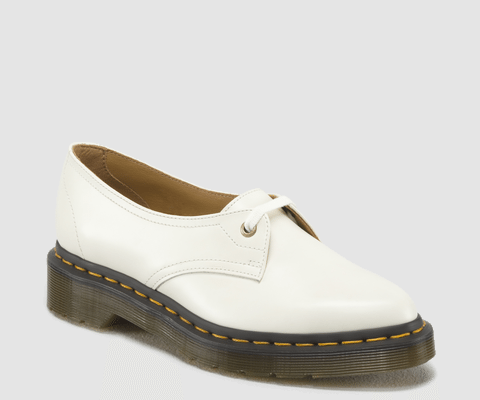 I HAVE to have the Doc M tassel slip on. Right now! Looking forward to hearing more from you…. this blog made me think about saddle shoes. Remember saddle shoes? There’s nothing better! Where oh where have they gone? i used to wear saddle shoes in college, with torn up blue jeans and a micky mouse tee shirt. it was one of my best looks ever. I love wingtips and love your description of these shoes as “assertive” footwear. They are great for weekends and jeans – skinny, cropped, whatever – all year long. There are loads of fun colors now too. Are Grenson shoes available in the US? Grenson shoes are available in the United States — but not widely. I found these shoes on Shopbop. Additional stockists are listed on Grenson’s website, but more importantly, they ship to the United States for reasonable rates and accept returns of unworn products during a 28-day return period. (Double check my research on the details.) Good luck!